It's a very "big" beer. By that I mean big flavors. Obviously a lot of hop flavor, but a lot of malt too. It's very good, but there's a reason it comes in 4 packs: it's very strong flavor and it's high alcohol content. 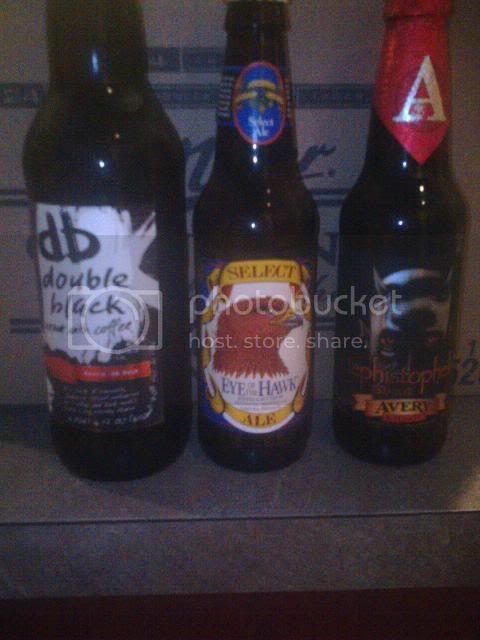 I finally tried that Sam Adams Chocolate Bock. It was good, but not as good at Youngs. If both of those are "too much" for some palates, try DogFishHead Chicory Stout. I tried one of the DogHead Fish beers....am searching my memory as to which one it was exactly...but that had to be the WORST beer I have EVER tried to drink (with the exeption of maybe Natty Bo)!!! I don't know that I am up to trusting them with my money again just yet. But am glad to hear someone out there is enjoying their offerings. I don't remember trying the Chicory Stout, I'm not a fan of the Raison d'Etre, and the Punkin Ale was OK but not what I was expecting. Some people really like the Aprihop. Has anyone tried the Pangea or Fort? The 90 is one of my favorite beers. It ranks top 5. I've also never tried the Raison d'Etre or the Red and White, or any of their other mixes. That doesn't sound appealing. They do, however, know how to make an IPA. Pangea gets a thumbs down. The Midas Touch was good but more along the lines of a dessert beer. I had one in the middle of summer and was mistaken when I thought it would be 'refreshing'. Honey and grapes (as on the label) would lend to a more 'wine' taste, almost like a cordial. Raison d'etre is probably my favorite of all DFHead beers. We tried the black and blue, and it leaved a lot to be desired. The festina peche' was a good spring beer, with lots of peach flavor. I haven't even seen the Fort out. I'm also interested in opinions on it. I also liked Raison d'Etre, but I also tend to try a new beer for novelty's sake, so you may never want to rely on my "beer taste", haha. I'm not that much of a beer drinker, but usually take a 6-pack along camping over the summer (only go a few times, so again, not much of a beer drinker). Gives me a chance to try something new on occasion without committing to a bunch of bottles hanging out in my fridge for weeks. I also enjoyed Clipper City's "Small Craft Warning Uber Pils" (but was threatened by fellow campers when I showed up with that to camp in the middle of a Labor Day hurricane one year. Have to rethink my "themes" when it involves rain and camping...). Maybe Troeg's Rugged Trail Nut Brown would have been a better choice. If you knew how often we have camped in pouring rain (not just rain or showers, and we've done 2 hurricanes so far, in 14 years), you could appreciate why they threatened me with bodily harm over that one. Yeah, I'm thinking Rugged Trail may be safer in future, LOL...! Sitting here now trying out an interesting lil beer Breckenridge Brewery's Remarkable Vanilla Porter. I think I like it very much The vanilla adds a little smoothness to the porter's normal "edge" without taking away from the full bodied flavor. It's not too sweet and not too bitter, definitely "Partakable" as the label proclaims!! I am going to sip it and see what notes come through as it warms a little. So far, so very, VERY good! I see you are subscribing to the "it's 5 o'clock somewhere" theory. We're enjoying a homemade mexirita right now. What's that you say? I found their website a while back and sent an email to find out where I could sample their brews, but I never got a response. We were in Maryland City today and picked up a 6 pack of singles. The two we had tonight were North Coast Brewery's Old Stock Ale (12.5%, very Barleywine-esqe), and Leinenekugel's new spring 1883 Bock. Both were delicious, and worth a full compliment of 5 more of their siblings. Give Fordham's new Dopplebock a try. I thought it was decent. Nothing spectacular, but worth a try. Sort of a dark, medium thickness, toffee flavored lager. Is it bottled yet or solely on tap? 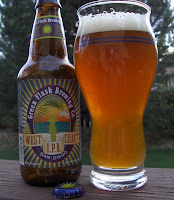 Green Flash Brewing Co's West Coast IPA and Sierra Nevada's ESB (Early Spring Beer). That ESB looks good. The Fordham dopplebock is in bottles. I found it at Bakers. Sam Adam's Chocolate Bock and Fordham's Dopplebock both on tap at Heroes last Thursday. Don't know how long it will last, but the Sam's was pretty good! Sounds good. I'm dying to try that Dopplebock. The Eye of the Hawk was good but disappeared flavor-wise as you drank it. Very clean, but unremarkable. Think of an IPA light. Avery's Mephistopheles was ridiculously good. 16%ABV and it tasted it. Dark black body in color, but the head was a deep cherry color. Very heavy and bold. We only had one after dinner and it as all you needed. Let it warm to room temperature and you'll get the most flavor from it. I discovered a really good new to me beer last night. Clipper City Loose Cannon IPA. It was on draft at the Federal House in downtown Annapolis. Ridiculously hoppy and citrusy and tasty. Don't know how I've missed this delicious local beer. I hope one of the local stores has it for sale. Sure does. Try all of Clipper City's Heavy Seas brews. 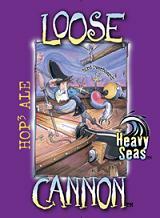 Ditto on those, especially liked the "Heavy Seas Loose Cannon" and "Peg Leg"!